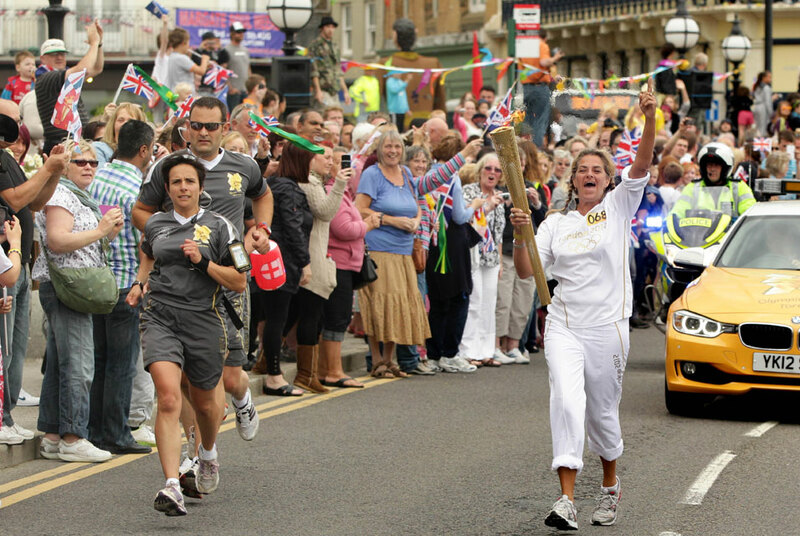 British Artist Torchbearer 068 Tracey Emin as she carries the Olympic Flame on the Torch Relay leg between Margate and Westgate-On-Sea in southern England Thursday July 19, 2012. AP Photo/Yui Mok/LOCOG. LONDON (AP).- She's won the Turner Prize and shown the world her messy bed, but artist Tracey Emin says carrying the Olympic torch was an overwhelming experience. The artist ran with the flame Thursday through her seaside hometown of Margate in southeast England, posing on the steps of the Turner Contemporary art gallery, currently showing an exhibition of her work. Emin said the experience had been "like the most surreal dream you can ever imagine"  and exhausting. She confessed that "it's a long way. I haven't run since about 1978." Emin is renowned for her provocative and confessional art. Her most famous works include a recreation of her disheveled bed  complete with soiled clothing and empty vodka bottles  and an appliqued tent entitled "Everyone I Have Ever Slept With."